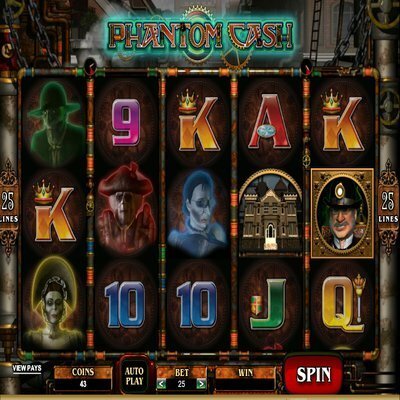 [miau] The Phanton Cash Slot review is a five reel, twenty-five payline non progressive online slot that comes with WILD symbol, Scatter Symbol and a Multiplier. 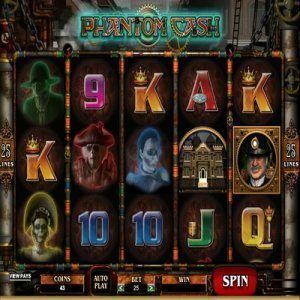 The game comes with a maximum jackpot amounting to $12.5 K. Phantom Cash is mainly comprised with symbols of ghouls and sprectres, yet the game is more exciting that what the name suggests. The developer, Microgaming, did a great job developing clear graphics, and great sounds effects and, for the nature of the game, easily give a player, the a Halloween high, tht potentially could be very lucrative. The game is full of free-spins, scatters and opportunity to graduate to the highest ranks of ghost catchers. The game’s graphic can easily transport a player to the best horrors that fill contemporary television programs, at the same time introduce them into antique dark themes, of horror as was invented. The tow ghost catchers, appropriately named Thurmingham and Carstairs. These two are responsible for giving players bonus plays, as they appear at the first and fifth reels, thereby offering large payouts from such wins. Also, symbols of haunted mansions, present a player with opportunity to earn cash rewards for every ghost they capture. When all ghost within a row are captured, a player garners a win and a bonus round where they get to enjoy both the horror and chances of making more bucks. The betting coin range from a penny to a quarter per payline, with a maximum betting amount of $125 and the least amount at $0.25. These amounts offer players opportunity to play for the fun, for the fear or for the dollar. The underlying return here is players can enjoy the three, without breaking the bank. The jackpot is represented by a maximum of 5k coins, and as mentioned is valued at 12.5K dollars or pounds depending on the currency is use. The players have an option of employing as much as 20 coins per payline, in 25 paylines that makes a maximum of 500 coins per play. Therefore, is a player is playing the maximum value of a quarter for every coin, the value of maximum bet is 125 dollars or pounds. While the game has many popular features and its elements, from betting limits, to jackpot rewards are high, there is an important feature it misses; free spins. There is no feature that gives players a better high than free-spins. Players revel on the state that they can get to play, for free, it is like a discount, it is a great feature and should always be included in any game. It is almost like giving a player another chance to make good and, it is not the same with a bonus feature. The return to player, for this game is hard to accurately verify although assorted data show that players enjoy as much as 97% RTP. This is above average, and makes phantom cash highly competitive. The reality and reward is worthy every play,and coin.